Monsignor Pio Bello Ricardo’s written communication to Mrs. María Esperanza de Bianchini where he conveys that she may accept invitations to participate as a speaker at Marian Conferences; for she is the main witness of the Apparitions of Our Lady in Finca Betania, Venezuela. Calle Junín, N. 19 – Los Teques – Venezuela. I consider appropriate to put in writing my answer to your telephonic consultation. Thus, you may make use of it with my authorization. On many occasions you have received invitations to travel to different places. People are interested in having direct information from you about the apparitions of Our Lady in Finca Betania, and the messages transmitted to you by Our Lady. For example, the invitation you received from the Archdioceses of New York. I consider it correct for you to accept these invitations for this purpose. I must leave it to your prudence and discretion to judge the seriousness and ecclesiastical sense of these invitations. Likewise you should also judge the respect and obedience of the hosts with regard to the ecclesiastical authority of their jurisdiction. As guidance to the content of the information you will transmit on such occasions, I convey to you the remark that the Prefect of the Sacred Congregation for the Doctrine of the Faith, Cardinal Ratzinger, made: It is needed to differentiate carefully what has an official sanction from the ecclesiastical authority regarding this issue, i.e. my sanction as Bishop of Los Teques; and, what does not have a sanction. I understand as a sanction the statement through which the ecclesiastical authority approves and authenticates a fact, or a truth of a doctrine. 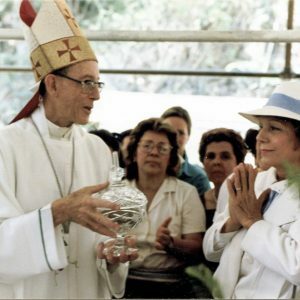 Regarding Finca Betania, what has my official approval is what is stated in the “Pastoral Letter on the Apparitions in Finca Betania”, issued on November 21, 1987. I must state that to distinguish between what is officially sanctioned and what is not officially sanctioned does not imply per se that one is more truthful or worthy than the other. But it is pivotal to establish the difference, because in terms of religious phenomena, considering a prudent traditional praxis, the ecclesiastical authority can merely observe, allow, approve, recommend or sanction. Now then, these qualifications must be clear to the faithful concerning their ecclesiastical discipline. I beg the Lord to illumine you, and to make your words fruitful when you are placed under the circumstances that I have referred to in this communication.